The few months I spent working alongside a cheesemonger are among my most fond memories in the culinary world. Learning about cheese production and sampling incredible artisanal products from the best American and European regions was a wonderful excursion, working on pairings a complete pleasure. Being in the company of a cheesemonger who had an inordinate passion for quality made it a real journey of the senses. When a new shipment of cheese would arrive, he and I would look at each other with the excitement of little children on Christmas morning, anticipating the heady aromas and anxious to get our hands on beautiful packages exquisitely wrapped with the unique expression of the giver. This dessert reminds us of the wonderful friendship of blue cheese and pears. I love pears so much that I’m always trying to think of new things to do with them while still preserving their fresh and delicate perfume. This is an easy dessert that presents all the delicious qualities of beautiful pears reclining on a pillow of luxurious cream atop a super tender biscuit flavored with blue cheese. 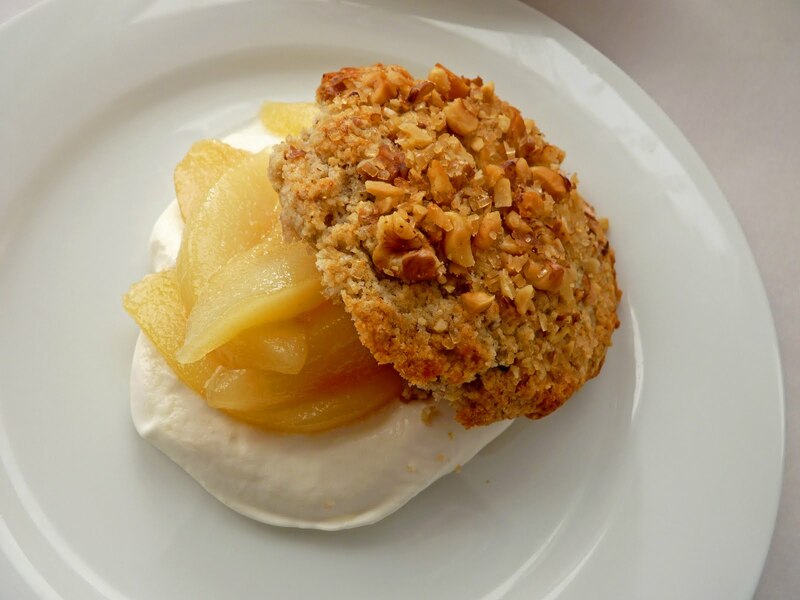 Although the dessert has three different components, the biscuits come together very quickly in a food processor, the less handling the better. The mixture looks like a pile of crumbs about the size of barley grains and all you need to do is gently coax them together by pressing them into a round. Cut them out and they are baked in about 13 to 15 minutes. If your pears are sufficiently ripe, they are ready in just a very few minutes. Whisk some heavy cream and you’re all the way there. I use ripe but firm Bartlett pears for their lovely soft texture and Bleu d'Auvergne cheese for its relatively mild but sumptuous blue flavor. Bleu d'Auvergne is an Appelation d'Origine Controlée (controlled designation of origin) cow’s milk cheese from the Auvergne region in south-central France. Its origins trace back to the middle of the 19th century and it’s a cheese that goes particularly well with dessert wines. It's pretty firm but still delectably creamy and I think these two pair very well. The biscuits offer a chewy morsel to support the pears, which are bathed in a delectably light syrup of honey, water and a spritz of lemon. The cream is simply whipped and slathered generously to bridge the textures. Taken together, this becomes a very fun way to explore and savor the pure nature of each. - To toast walnuts, place them on a baking sheet in a 350 degree oven for about 10 minutes. They should brown slightly and give off a lovely toasty fragrance. - The pears should be ripe but not mushy. The amount of time you simmer them will depend on their ripeness, so check them after just a few minutes. - If your blue cheese is salty, reduce the salt in the biscuits to just a pinch. - I used a 2 1/2” biscuit cutter and I got 6 biscuits. Space them a couple of inches apart on the baking sheet because they expand to a finished diameter of 3 1/2”. - Once you add the buttermilk, do your best not to handle the dough too much. It will toughen the finished product. Gently press and pat the dough into a solid mass, do not knead it. - The biscuits are very tender and fragile, so be sure to let them cool completely before handling. 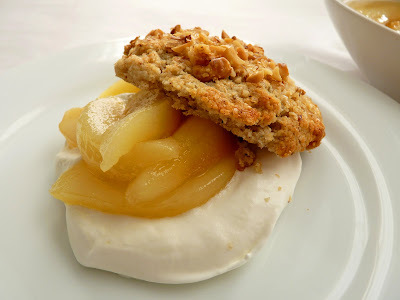 - These biscuits would also be really good with fresh fig slices in this syrup or perhaps a sweetened red wine reduction. - Another way to serve is to make a trifle of sorts, layering crumbled biscuit, whipped cream, fruit and syrup in parfait glasses. - If you don’t care for blue cheese, try the pears and syrup with Cinnamon Pecan Biscuits and substitute walnuts if you prefer. - If you’re a pear lover, try the super delicious Pears in Honey Pine Nut Caramel with Artisanal Cheese or creamy Pear Pots de Crème. If you enjoy the combination of blue cheese and fruit, consider the unusually tasty Blue Cheese Cookies with Fresh Fig Jam. To prepare the pears, combine the honey and water in a saucepan and simmer to dissolve. Add the lemon juice and remove from heat. Peel, core and slice the pears and place in the honey syrup as you go to prevent browning. Return to low and gently simmer for a few minutes or until tender. Set aside to cool, spooning the syrup over the fruit every now and then to coat. Preheat the oven to 425 degrees. Prepare a baking sheet with parchment or a silpat. 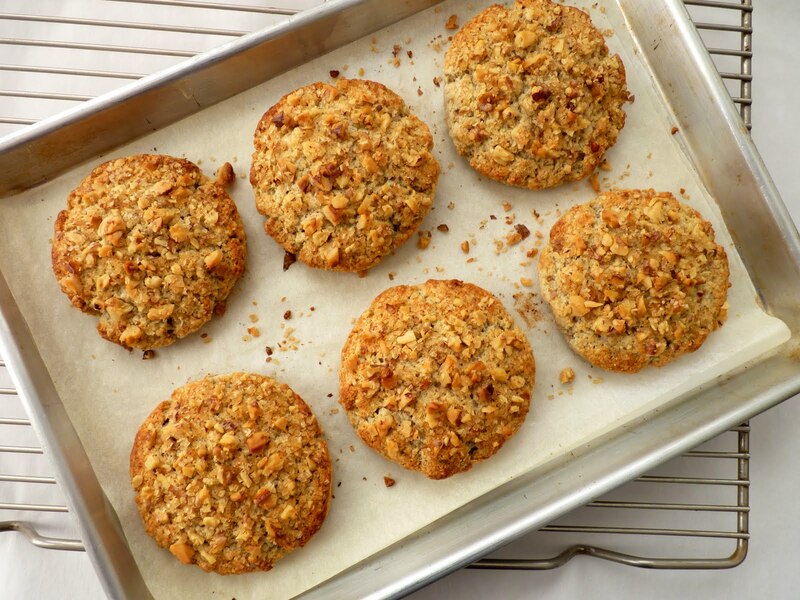 Prepare the biscuit top coating by finely chopping the 2 T + 2 t toasted walnuts and tossing with 1 tablespoon of sugar. Set aside. Melt 1/2 tablespoon of butter and set aside. For the biscuit mix, place the flour, salt, sugar, baking powder, baking soda and 1/3 cup of toasted walnuts in the bowl of a food processor and process until the walnuts are finely ground. Add the cold butter pieces and the crumbled blue cheese and pulse in short bursts about 10 times. Do not overmix. Add the buttermilk all at once and pulse another 10 times. The mixture should look like very coarse meal rather than clumps of dough. Work quickly so the butter stays cold and firm. Pour the crumbly mixture onto a clean work surface or a piece of parchment and gently gather, patting and pressing it together with your hands. Do not knead. Shape it into a round about 3/4” thick. Use a 2 1/2” round cutter dipped in flour to cut out 6 biscuits. Place them on the parchment-lined baking sheet at least 2” apart. Brush the tops with the reserved melted butter and sprinkle with the walnut sugar mixture, pressing down gently to secure the nuts. Bake about 13-15 minutes, until the biscuits are lightly golden. Cool completely before handling. Whip the cream to a very soft peak. It should dollop loosely. Cut the biscuits in half horizontally. Dollop with some whipped cream, layer with pears and garnish with plenty of syrup. With a pile of gorgeous oranges on my table, I focus on a cool and breezy Italian panna cotta for a bright bite of fresh citrus. What I love about panna cotta is the lighter quality it has due to the fact that it does not contain the eggs normally used to enrich puddings, custards and cremes. This lightness of being is a welcome cap to the rich and robust multi-course Italian meals that bring so much enjoyment and sheer gusto to any table. 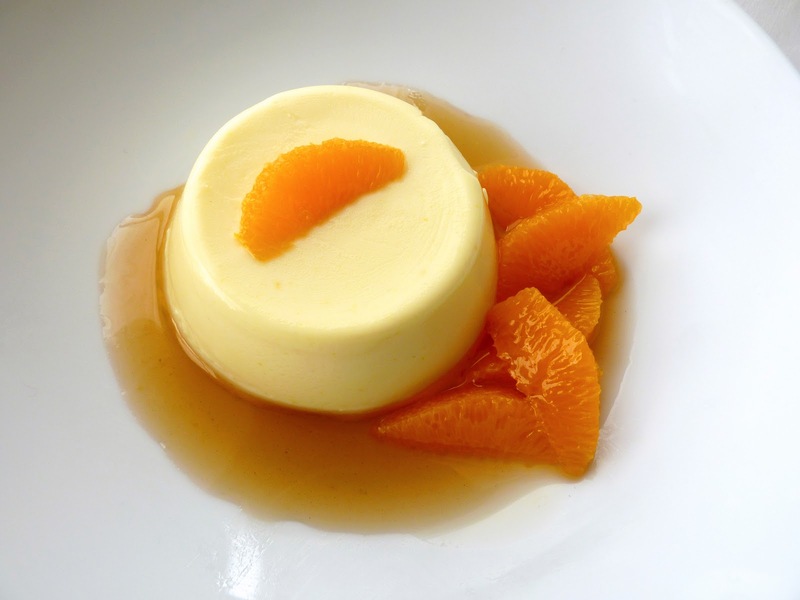 I also like the fact that panna cotta is very simple to prepare. Mix a few ingredients in about 10 minutes, refrigerate to set up and then presto! It's a very nice canvas for a multitude of flavors and garnishes. For a maximum clean tart citrus flavor, I combine the usual base of cream with a good dose of orange juice, orange zest and plain yogurt. I use the bare minimum of gelatin that will hold it all together but still deliver a nice creamy mouthfeel. The optional sauce is a combination of orange peel and cardamom steeped in sweetened Earl Grey tea. 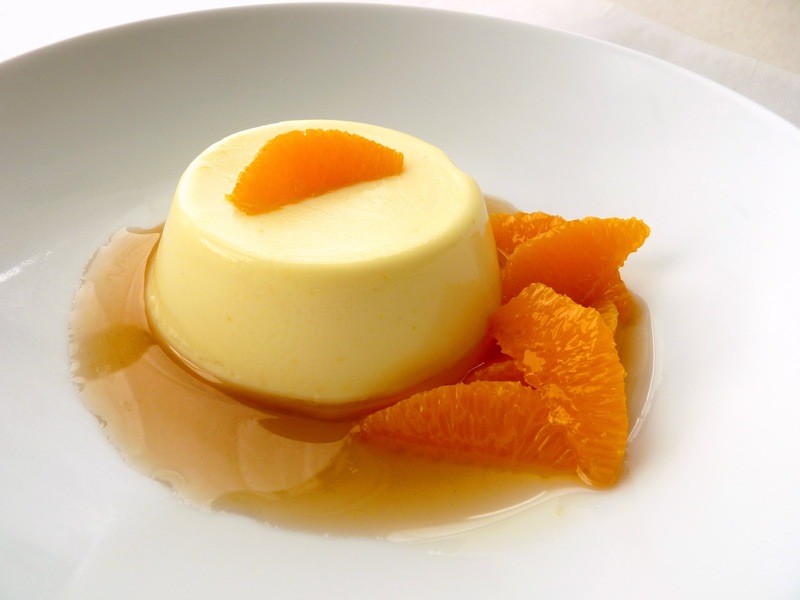 For a simple and refreshing dessert, panna cotta is pure Italian flair and delight. 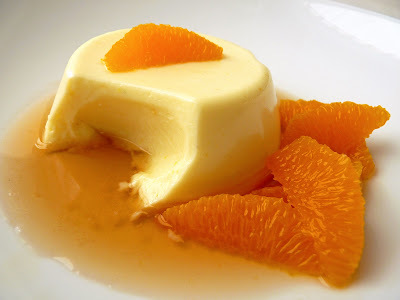 - You’ll need a total of 4 oranges for this dessert. - Always gently sprinkle gelatin into a cold liquid rather than pouring liquid onto gelatin, which will cause it to clump rather than dissolve. Do not stir. Once it has bloomed, it must be reheated to become a liquid. I use a small pyrex custard cup and place the bottom of it into a pan of shallow simmering water for a minute or two. Some people use a microwave but you must be careful not to let the gelatin mixture boil or you will have to start over again. - If your panna cotta doesn't turn out easily from the ramekin, warm the bottom of the dish by dipping in hot water for a few seconds. As you run a knife or small offset spatula around the edge to loosen, gently nudge and lift just a bit on opposite sides to create an air pocket. Then invert onto a plate and tap the bottom. - This is also good plain or you can simply garnish with a small dollop of whipped cream flavored with vanilla or Grand Marnier. - These are best when eaten the same day. Combine the heavy cream, sugar, orange juice in a saucepan. Zest two oranges into the cream mixture. Heat slowly until the sugar is dissolved. Take off the heat and steep for a half hour. Strain the cream into a bowl and add the yogurt, lemon juice and vanilla. Whisk thoroughly. Add a small pinch of salt, to taste. Sprinkle the gelatin into the water and let bloom for 5 minutes. Melt the gelatin by placing the bottom of the dish in a pan of simmering water. Whisk into the panna cotta. Pour into six 4 oz ramekins. Refrigerate for at least 4 hours. For the syrup, bring water to a boil and add tea, orange strips, cardamom and sugar to taste. Steep for a few minutes until it has the desired strength and strain into a bowl. If you'd like a thicker syrup, add more sugar and simmer until desired thickness. Cool completely. For the two remaining oranges, take a sharp knife and remove the peel and pith. Section each orange slice into a bowl and set aside. To serve, run a thin knife or small metal spatula around the rim of the panna cotta. Invert onto a plate and garnish with orange slices and sauce. 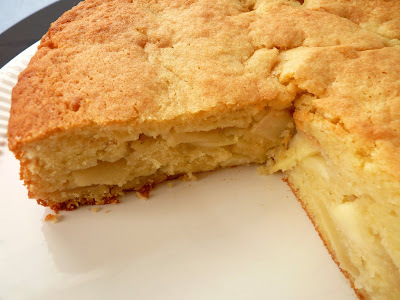 I return again to the comfort of apples to produce a very delicious cake I encountered at Leite’s Culinaria, a fun website I first became acquainted with years ago. If you haven’t visited there, take a moment to enjoy David Leite’s lovely beehive of culinary articles, discussion, recipes and other festivities. And thank goodness for apples. I remember working in one particular restaurant where we always sadly acknowledged the end of spring and summer fruit with the first large shipment of apples to peel, core and slice. This ritual of apple preparation would last for months until the first appearance of local strawberries and raspberries. I personally never tire of the wonderful variety of apples and their delicious adaptation in pastry any time of the year. This cake is all about incredible aromas and satisfying flavor. Cake batter and creamy apples are layered and baked into a delightful treat that will draw everyone with a nose for pastry to the kitchen. It’s called "drunken" cake because it has a good amount of rum. 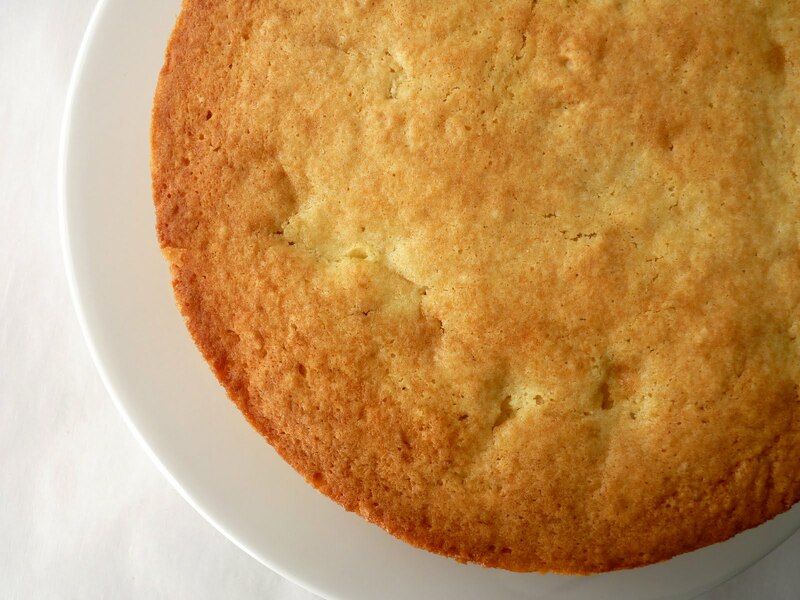 However, since the rum is diluted with an equal amount of water, the cake doesn’t have a pronounced flavor of alcohol but rather a really balanced and lovely earthy flavor. It has more of a cakey texture than the spellbinding Bolzano Cake due to a very different ratio of similar ingredients but it also has plenty of wonderful apple goodness. 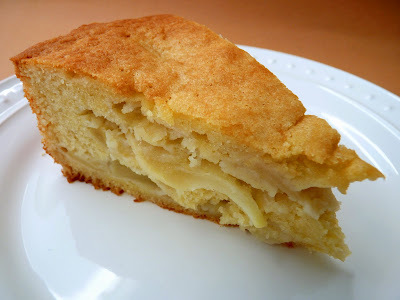 It’s a very delicious recipe to have among all your other fabulous apple cakes. - Choose an apple that is not too sweet (the crew at Leite's Culinaria do not recommend Granny Smith). I used a mix of Braeburn and Gala. - It’s very important to slice the apples very, very thin or they won’t cook through the way they should. I had a few pieces that still had a bit more texture than I would have liked, so try to slice them uniformly about 1/8" thin and you'll achieve a wonderful tender texture throughout the cake. - I placed the cake pan on a baking sheet to catch any possible leaks as it baked. - If you want to gild the lily, the cake would also be good with a dollop of whipped cream. - The cake will keep at room temperature for up to 4 days. - Note 2/17/11: I just got clarification from Leite's Culinaria that the cream is supposed to be added along with the apples to each fruit layer. I didn't do that so I bet the texture is really changed and even more delicious. I look forward to trying it again and would probably suggest piping the cake batter on top of the fruit layers rather than trying to spread it. I think that would make things a whole lot easier. I've amended the recipe to reflect this. For the apple filling, peel and core the apples. 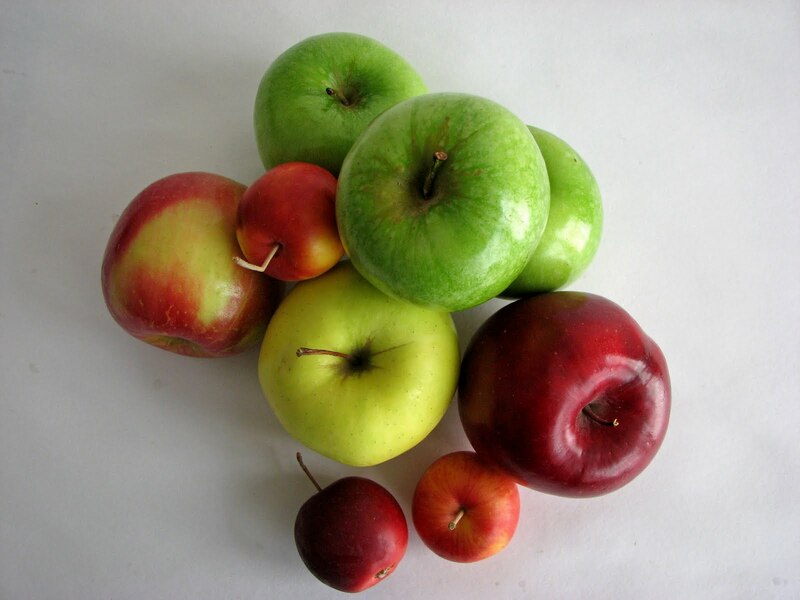 Cut each apple into uniformly thin slices. Combine the sugar and cream in a bowl and add the apple slices. Set aside until needed. Preheat the oven to 325 degrees. Prepare a 9 1/2” springform pan with butter, flour and parchment. The pan should be at least 2 3/4” high to hold all the batter. Beat the butter and sugar until smooth and creamy. Lightly beat the eggs and add to the butter mixture in 4 batches, scraping down the bowl and beating well after each addition. Fold in the flour in 4 batches. Combine the rum and water and add with the third batch. Add the last batch of flour and incorporate thoroughly but be careful not to overmix. Scrape 1/3 of the batter (about 1 C) into the prepared pan and smooth out evenly. Then spread half the apple and cream mixture on top, leaving a 1/2-inch plain border around the edge and smoothing out the slices so they’re fairly neat and level. If you have a pastry bag, scrape the remaining batter into it and pipe another 1/3 of the batter on top of the apples and all the way to the edge of the pan. 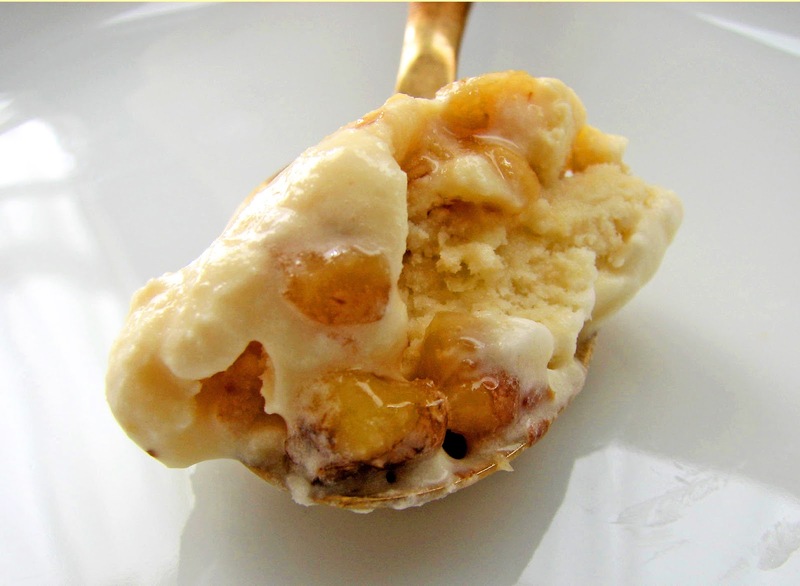 Pour the remaining apple and cream mixture evenly on top of the batter and spread out the apples evenly. Then top the apples with the third and final batch of batter, piping it all the way to the edge of the pan, which will be very full. Bake the cake for 1 1/2 hours or until a tester comes out clean. Cool for 15 to 20 minutes, then release the sides of the springform pan and place the cake on a wire rack to cool completely. Yes, I realize it’s early February and it’s snowing like crazy in many places! But this is some serious ice cream. 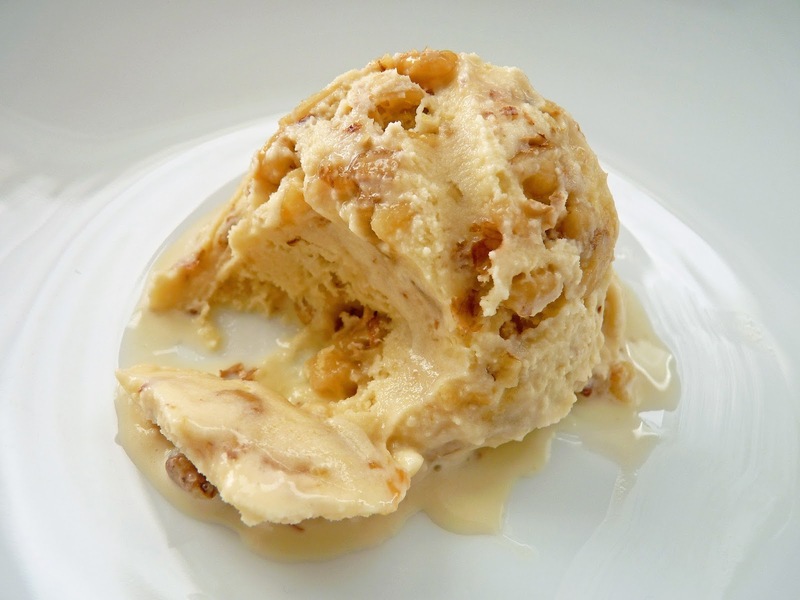 It’s the old fashioned reliable marriage of maple and toasted walnuts and it’s really fabulous. If you're a fan of these ingredients you will be in heaven at the very first bite. Maple syrup is a quintessentially American product that takes us back to the days before the early settlers arrived on our shores and Native Americans were tapping into the amber golden sap. They eventually traded it with the colonists and its use became widespread. Known primarily as a sweet breakfast condiment, maple syrup also finds its way into the world of pastry in many forms. 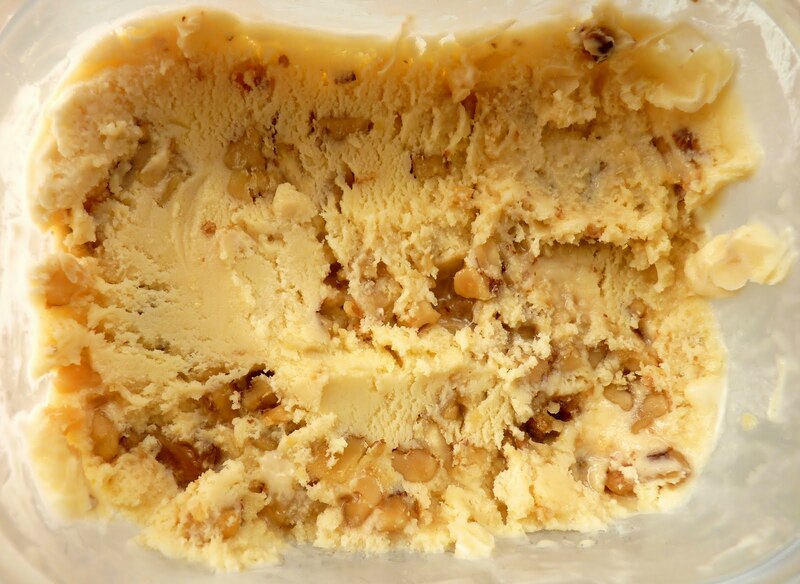 This ice cream formulation comes from David Lebovitz and it’s loaded with deliciousness. 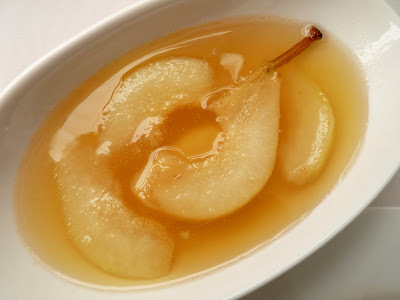 You usually have to prepare a maple syrup reduction to concentrate the flavor for desserts. But not so with this recipe. You just add a good quality syrup to the custard after it's been cooked. Lots of earthy toasted walnuts are also tossed in a warmed maple syrup punched up with a good dose of salt. When it all comes together you have a wonderfully rich ice cream with the right depth of maple flavor and creamy crunchy texture. I know it’s cold outside. But put on a sweater and make this ice cream as soon as you can. It will be delicious company until the roads are clear, the sun is shining and the birds of spring arrive once again. - Maple syrup is graded light amber, medium amber (Grade A) or dark amber (Grade B). The darker the syrup, the deeper the flavor. Use dark syrup for this ice cream if you can. - Be sure to toast the walnuts for maximum flavor. Place them in a single layer on a baking sheet and toast at 350 degrees for about 10 minutes or until they are slightly darkened and there is a toasty aroma. - Salt is very important to pop the maple flavor in this ice cream, so be a bit generous and taste as you go. - The walnut mixture should be made just before you're going to churn the ice cream to preserve the crunchy texture of the nuts. It should be cool enough to add to the ice cream but still sticky. Warm milk and sugar until sugar is dissolved. Pour the heavy cream into a bowl and set a mesh strainer on top. In a separate bowl, whisk the egg yolks. Slowly add the warm milk to the egg yolks, whisking constantly to combine, then pour the mixture back into the saucepan. Return to medium low heat, stirring constantly with a heatproof spatula and making sure to scrape the bottom of the pan, until the mixture thickens and coats the spatula. Pour the custard through the strainer into the heavy cream and stir to cool. Add maple syrup, salt and vanilla. Stir to combine and taste for the right level of salt. Pour into an airtight container and chill thoroughly. For the walnuts, heat the maple syrup until it just begins to come to a full boil. Stir in the walnuts and salt and cook until the liquid comes to a full boil again. Stir the mixture for 10 seconds, then remove from the heat and let cool completely before using. The nuts will be sticky when cooled. Freeze according to your ice cream maker’s instructions. During the last few minutes of churning, add the walnut mixture. Pour into a clean airtight container, press a piece of plastic wrap onto the surface, cover and place in your freezer to firm up.